The Challenger 605 succeeded the 604 in 2006 to become Bombardier's flagship Large jet. It features a 14% increase in window size to its predecessor, allowing for more than a 30% increase in cabin natural light and providing passengers with an even better view. It has also received upgrades to its operating system and design. The addition of sleek winglets not only make it easily distinguishable from the 604, but also, along with engine upgrades, serves to boost performance. 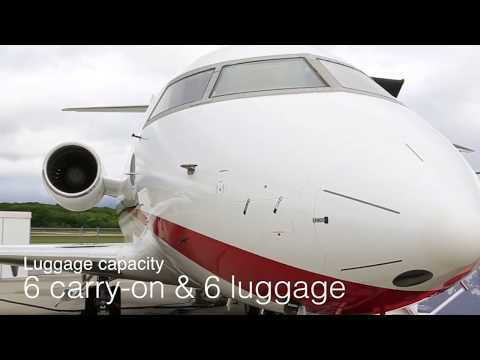 Consequently, the Challenger 605 offers an even greater range than the 604, as well as being more efficient. It offers the same extra-wide cabin, seating 9 passengers in optimum comfort, and its modern noise reduction and stabilisation technology ensure a smooth and quiet journey. Overall, the Challenger 605 has a much more contemporary feel that its predecessor and balances comfort with performance to provide an excellent service.